The Coptic monastery known as Deir Al-Surian, or the Monastery of the Syrians, contains more than 3,000 books as well as a vast number of texts in Syriac, Aramaic (the language of Christ), Coptic, Arabic and Ethiopic. They date upwards from the fifth century and today, as a result of the revival in Coptic monasticism in recent years, a new generation of educated monks are anxious to safeguard this heritage. Both Syrian and Coptic monks are engaged in their conservation, as well as restoration of the monastery itself. Collaborating with them on what is known as the Deir Al-Surian Library Project is the Levantine Foundation. The aim is twofold: to salvage old manuscripts which, after surviving a century and a half in a living community, are in danger of being lost, and to conserve the remaining literary inheritance of more than 1,000 Syriac manuscripts for future generations. The project is moving ahead and members of the conservation team, with the help of volunteers and on a shoe-string budget, are surveying, restoring, cataloguing and storing the Syriac texts in a suitable environment. A digital photographic record of each manuscript will eventually be made to facilitate access for scholars, and appropriate storage for the manuscripts and facilities for visiting scholars is also planned. There follows an interesting summary history of the monastery. Two thoughts. I hope that the digital record of the manuscripts will make its way online in due course. And, as always, I hope that study of these manuscripts will uncover new copies of known and unknow Old Testament Pseudepigrapha. Our project is probably too far advanced to take account of such finds, but future More Old Testament Pseudepigrapha projects will be able to include them. THE IN THE BEGINNING: BIBLES BEFORE THE YEAR 1000 EXIBITION is reviewed by Rebecca Cursey in National Review Online. A NORWEGIAN PH.D. THESIS ON JOSEPHUS is noted by Torrey Seland on the Philo of Alexandria blog. ANTIOCHUS EPIPHANES -- not such a bad guy either? Antiochus IV Epiphanes (215-163 BC), ruler of the Hellenistic Seleucid Empire, was known as an eccentric king. He spent his childhood as a hostage in Rome and ascended to the throne only due to the surprising death of his father and murder of his brother. When he inherited the kingdom it was already in decline. However, this does not explain the moves that made him infamous to this day - the brutal edicts he issued against the Jews in 167 B.C., forbidding them to practice their religion. "The reason for Antiochus' oppression of the Jewish faith, attack on the Temple and prohibition of the Torah precepts is not explained by the existing historic sources," says Dr. Steven Weitzman, a lecturer of Judaism in the University of Indiana and the author of Surviving Sacrilege: Cultural Persistence in Jewish Antiquity. Weitzman analyzes the description of the edicts in the Hanukkah tale, and concludes that the story was concocted by the Hasmonean kings as propaganda intended to legitimize their precarious rule. The Hasmoneans used literary tales dating back to ancient Eastern kingdoms as the basis for their story of Antiochus, he says. In a recent essay in the Journal of Biblical Literature Weitzman says these explanations are based an unfounded speculations. He suggests checking what purpose the story about Antiochus' edicts was meant to achieve, and how it served the interests of those who wrote it - the supporters of the Hasmonean kings. "The Maccabees have been considered heroes for so long, that it is hard to imagine that in their time, their rule was extremely controversial. They and their descendants, the Hasmonean dynasty, presented themselves as high priests, but did not belong to a family that held that position for a long time. Neither did they belong to the House of David dynasty, which was supposed to produce kings. Therefore many Jews did not recognize the Hasmoneans as legitimate rulers." "The story of Antiochus' edicts is part of the effort to justify the Maccabee's rule. This is why they described themselves as protectors of the Jewish tradition, a tactic which many rulers and conquerors in the ancient East used to justify usurping power," he says. You can download the JBL article from this page. It's in JBL 123.2, Summer 2004. This is a large file that contains a PDF version of the whole issue. Weitzman's position is far from acceptable to many researchers of the Second Temple era. Professor Joshua Efron, a senior historian of the Hasmonean period, believes the Maccabean revolt and ensuing rule were accepted by the majority of the nation. "The Maccabees were undoubtedly widely supported," says Efron. "Otherwise they would not have been able to conduct guerilla wars as they did. A minority cannot rebel and wage such war without popular support." Efron has no difficulty explaining Antiochus' edicts. "Indeed, this was not customary Hellenistic kings' behavior, but some believe the initiative to issue the edicts did not come from Antiochus but from the Hellenist Jews, who wished to amend the Jewish religion," he says. It's interesting to note that the sixth century chronographer John Malalas has an account of the Maccabean revolt in his Chronicle (8.22-23) which is arguably based on Seleucid sources and gives a somewhat more positive picture of Antiochus. But it would not support Weitzman's theory that the persecution was just Hasmonean propaganda. 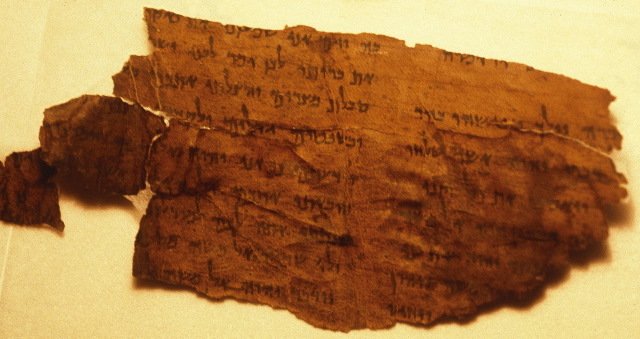 We plan to include Malalas' account in the More Old Testament Pseudepigrapha Project (as "8 Maccabees"), although we don't yet have an editor for it. HAPPY HANUKKAH to all those celebrating. It begins this evening at sundown. ST. PAUL'S SARCOPHAGUS (if that is indeed what it is) is discussed at the Bible Places blog. HEROD THE GREAT -- not such a bad guy after all? He ruled over the ancient Jews for 37 years, and when it comes to bad publicity, King Herod has reigned supreme ever since. Annually vilified in Christmas pageants as the tyrant responsible for the slaughter of Bethlehem's baby boys and for chasing Mary, Joseph and Jesus into Egypt, Herod the Great should receive more balanced treatment, some historians and academics argue. Like most biblical villains -- Judas, Caiaphas and Pontius Pilate, take your pick -- Herod has simply gotten a bad rap, some say. For example, historians say Herod probably never ordered the Massacre of the Innocents that Christians commemorate in late December. True, but, as the article notes later on, the deed would have been entirely in character. The article is quite right that Herod accomplished some remarkable things during his reign, including the rebuilding of the Second Temple. But such information as we have about him (and to be fair, most of it comes from Josephus who is not always to be trusted) indicates that he was also murderously ruthless and was probably not in the best of mental health, especially later in his life. PIERLUIGI PIOVANELLI is guest-blogging at Apocryphicity, with a post entitled "Gospel of Judas opens old wounds." He comments on recent publications and has redactional notes on the differences between the English and French versions of some of them and the scholarly conflicts those differences reflect. Ronit Shoshany, "Rabbi Shimon ben Yohai in the Cave and Elijah in the Wilderness: A Comparison between Talmudic and Biblical Narratives"
Rabbi Shimon ben Yohai is described in talmudic and midrashic sources, for the most part, as a righteous scholar and wonder-worker. The Babylonian version of the cave narrative (Shabbat 33b–34a), however, offers a more critical portrayal. This paper presents an analysis of the talmudic cave narrative and compares it with the Elijah biblical narrative in I Kings 19. There the prophet behaves like a zealot, abandoning his community and entering the wilderness due to his disappointment with human nature. Despite finding some individuals who are faithful to God, Elijah remains critical of his entire people. The central argument of this paper is that the Babylonian redactor fashioned the cave narrative as an analogy to the biblical narrative, with changes appropriate to the different time period and plot. You can download it in PDF or Word format here. VATICAN CITY (Reuters) - The Vatican said on Monday it was studying the possibility of opening a thick marble sarcophagus believed to contain the remains of the 1st century apostle St Paul to study its contents. The prospect was raised at a news conference at which Vatican officials unveiled the results of an archaeological dig which has made part of the sarcophagus in Rome's Basilica of St Paul's Outside the Walls visible to pilgrims. "We tried to X-ray it to see what was inside but the stone was too thick," said Cardinal Andrea Cordero Lanza di Montezemolo, archpriest of the basilica on Rome's outskirts. Wouldn't it be nice if it turns out that copies of his letters to the churches were buried with him in an airtight container? In a cramped jail cell in Alexandria, Egypt, sits a soft-spoken 22-year-old student. Kareem Amer was remanded to over a month in prison for allegedly "defaming the President of Egypt" and "highlighting inappropriate aspects that harm the reputation of Egypt." Where did Amer commit these supposed felonies? On his weblog. If the Alexandria prosecutors' standards of censorship were applied in the US, thousands of Americans would be behind bars. The Egyptian authorities' decision to jail an obscure student for his blogposts reveals a larger struggle for free speech playing out between dissident bloggers and state prosecutors across the Middle East. Theological comfort zone. But can there really be any reconciliation of those who believe that salvation comes from the outside, through the redemptive act of a divine savior, with those who believe that it comes through self-knowledge? Such a difference, Johnson, Wright, and other traditionalists argue, cannot be explained away by scholars like Pagels as merely politically motivated differences. The distinctions reflect profound theological and anthropological convictions about human nature and its relation to the divine. The core Christian teaching is wrong, Wright insists, if the Gnostics are right. "In other words," he says, "you are not the spark of light; you are part of the problem. And if you look deep within your heart, and you are true to what's deep within your heart, then you will actually mislead yourself and others that you drag down with you." The Gnostic perspective is unlikely to wither even under such forceful attacks. Its defenders, past and present, inevitably intellectuals like those second-century, Greek-speaking eggheads, are always ready with a quick "Yes, but." "This is an exciting time to be a scholar," says Marvin Meyer. "There are now so many new approaches and possibilities and ways of putting things together that they allow people to find out where their theological comfort zone is." The Gnostic claim that the truth lies within fuels an argument so deep and old-and indeed so fundamental to who we think we are-that it is hardly surprising that it finds expression in our contemporary culture wars. And unlikely that it will cease doing so in the culture wars to come. For a related post, see here. A CALL FOR SUBMISSIONS to Biblical Studies Carnival XIII has gone out at Tyler Williams's Codex blog. This edition will include a Best of 2006 section. "THE LOST GOSPELS," a documentary on the apocryphal gospels, was shown on BBC 4 last week. I didn't see it, but the comments I've heard on it have not been positive. And the Apocryphicity blog links to a very negative review. UPDATE ON THE ARRESTED EGYPTIAN BLOGGER: His story has been covered by CNS News and MEMRI. And don't forget the Free Kareem! blog. No real news; he's still under arrest. I wish the case were getting more attention from the big media organizations. THE FROM ABRAHAM TO JESUS EXHIBITION has come to Nashville.